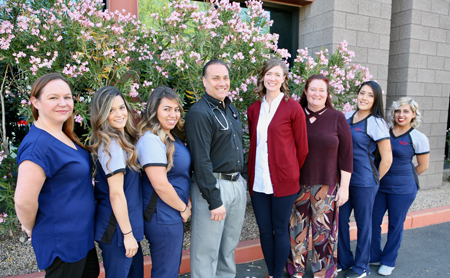 The Nava Family Medicine office is located in a comfortable newer building in east Phoenix, and features the kind of state-of-the-art equipment necessary to provide the highest standard of health care. Led by Dr. Nava, the professionals at Nava Family Medicine are specifically trained to ensure that your health care needs are met in an effective and timely manner. Additionally, all of the medical assistants at Nava Family Medicine are certified and bilingual, to ensure that our patients needs are met no matter what they may be. Angie graduated from the Physician Assistant program in 2004 from A.T. Still University Her undergraduate studies were at the University of Arizona. She is currently a doctoral student in the online education program at A.T. Still University. 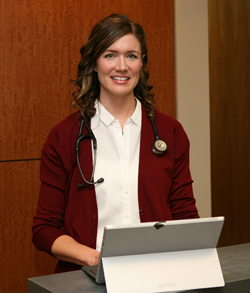 After becoming certified as a PA, she worked in pediatrics for one year and then dedicated herself to family medicine under the supervision of Andrew Nava, M.D. at Nava Family Medicine in Phoenix. Her interests lie in providing high quality care to patients from diverse backgrounds and all ages. She also desires to provide students with knowledge dissemination, frequent feedback, and encouragement as they learn to become competent providers. 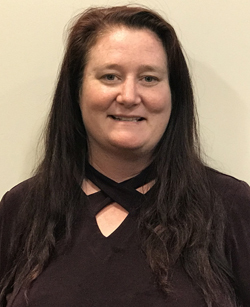 Prior to PA school Angie taught 1 year of high school biology and several years of environmental biology and A&P labs at Grand Canyon University. Since 2016 she has been at A.T. Still as an adjunct professor for the Advanced PA students online masters program. She taught medical ethics and clinical medicine. She started at full time residential faculty in 2018. Angie is the proud mom of an 11 year old who is very busy with her academic achievements, competitive swim and piano studies. Her daughter’s favorite book at the moment is Hot Zone by Richard Preston and she thinks she wants to be a molecular virologist when she grows up. When not being a mom Angie enjoys travel, gardening, and the last book she read for fun was In Search of Soul: Hip-Hop, Literature, and Religion by Alejandro Nava. Heather is originally from Kirksville, MO, where she attended Truman State University for her undergraduate degree in Health Science and pre-PA studies. She moved out of the humidity and into the desert in 2002 to start her graduate program at A.T. Still University in Mesa, Arizona. She graduated from the Physician Assistant program in 2004 and has gained over 13 years of experience in family practice and internal medicine throughout the East Valley. She joined Nava Family Medicine in 2018 and hopes to become active within the community where she now lives and treats patients. Heather's interests include preventative medicine, Women’s Health, and getting to know the families that have been patients of Dr. Nava’s for many years. Heather enjoys hiking and camping with her husband, traveling back to Missouri to visit family, St. Louis Cardinals baseball, live music venues, and trying out new restaurants.